Size: Colonies reach 14 cm in diameter with corallites projecting up to 5 cm above the base and reaching 12 mm in width. This species inhabits shaded surfaces, such as undersides of large rocks and caves down to 40 m depth. Colonies sometimes dominate habitats not occupied by other coral species. Specimens in deeper, calm water have larger corallites, than specimens in shallow, high-energy water. The Orange Tube Coral also colonizes artificial structures. Tubastraea coccinea is heterotrophic and unlike most other stony corals in Qatar it does not contain symbiotic algae, so called zooxanthellae in its tissue. It usually extends its beautiful tentacles at night. 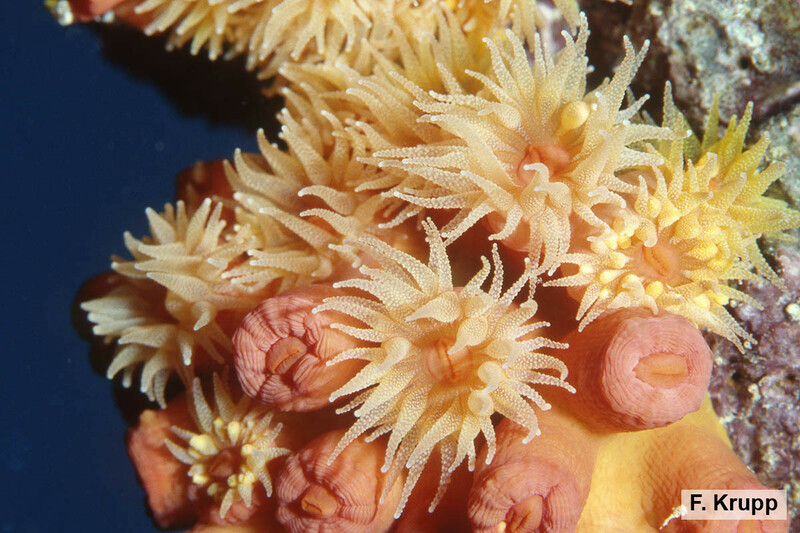 The Orange Tube Coral is widely distributed in the Indo-Pacific region including the Arabian Gulf and has been introduced into the tropical Atlantic. This species has not yet been assessed for the IUCN Red List. It is common, and not affected by coral bleaching. Tubastraea coccinea is a non-reef building, large-polyp stony coral of cushion-like shape, or forming low bushy groups of corallites with branches arising from relatively narrow bases. Corallites are flared, trumpet shaped and round. Septa are arranged in four ordered cycles. The wall of the columella is striated with sharp dentitions. The color of the tissue covering the skeleton is yellow-orange to deep orange or red, while the translucent tentacles are bright orange or yellow.